A large pine front door from a house dating back to 1896. Note the glass doesn't meet modern safety regulations. We can remove the glass for free prior to despatch, or can quote to replace the glass. This could be double glazed with some conversion. please contact us for a quote. Includes a nice arched detail at top of the upper panels and the lower 3 glass panels have a distinctive Cricket Bat style design. 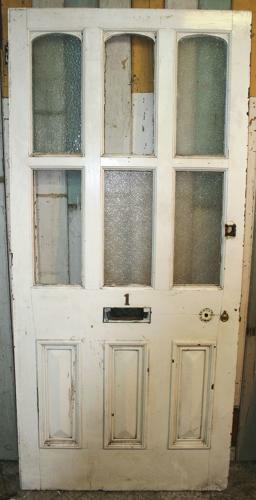 Both faces on the base have bolection mouldings, a beautifully made, solid, morticed and tenoned door.